I was attending Joseph Lane School in 1961 at the time. They showed movies in the gymnasium on school nights usually starting around 6:30 or 7:00 pm. This only happened for about a month, but I made the most of it. The admission cost was a can of food to be donated to The Sunshine Division. The canned admission also included a bag of home-popped popcorn. The same movie was shown for about a week, so I could see one of my favorites for as many nights as I had the canned admission. "Toby Tyler" was one of those favorites. 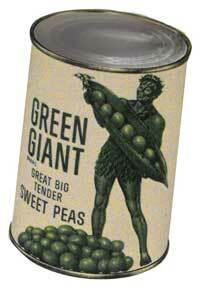 I went to see it many times, often depositing a can of green beans or peas into the giant barrel. I went with my brothers, neighbor kids, or anyone else that wanted to see the movie. We sat on the bleachers and stared at a makeshift screen that presented the show. 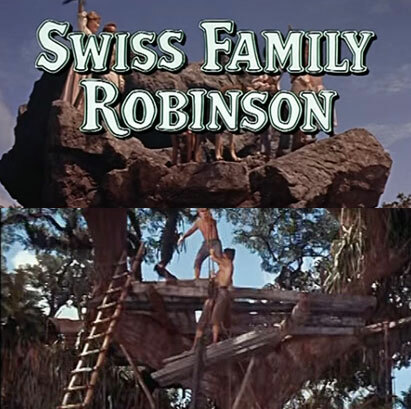 Another favorite of mine was "Swiss Family Robinson". 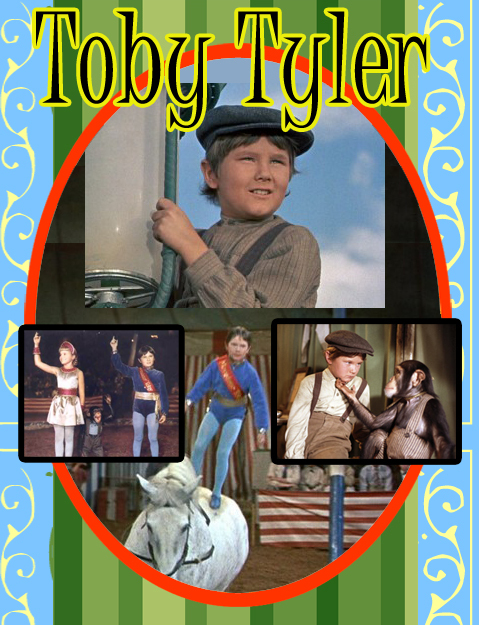 The allure and adventure of island life was always fascinating for me, but my true favorite was "Toby Tyler." After school events were great no doubt owing to the fact that school itself was too rigid and structured for any horsing around the halls, or play time. Therefore, any "off duty" happenings at school that were fun were unique. It was also great to be able to roam the halls or other areas when school and classes were not in session to get an overall feeling of its grandeur. I especially liked these after school events because mom and dad, or my brothers could come and see where I spent my days. On the first night we went to the evening show it was dark and cold. Fall had settled into the neighborhood. It was that special time of year when damp windows fogged, and one's breath could be seen in the cold night. The nights came much earlier smothered in blackness and often falling rain. I always loved the rainy nights when I could look up to see the rain that looked like Christmas tinsel against the glow of the street lights. On this evening we were spared the wet, but the cold made up for it. The long walk across the back of the school field was marked with towering pines and rough grass. The walk seemed long, mostly due to the chill and anticipation of the movie. We yakked the entire trek across the school's back field discussing the movie, and how cool it would be to join a circus. My coat pockets were loaded with cold hands and a can of peas. The chill that sneaked down my shirt collar stayed with me until we got inside. 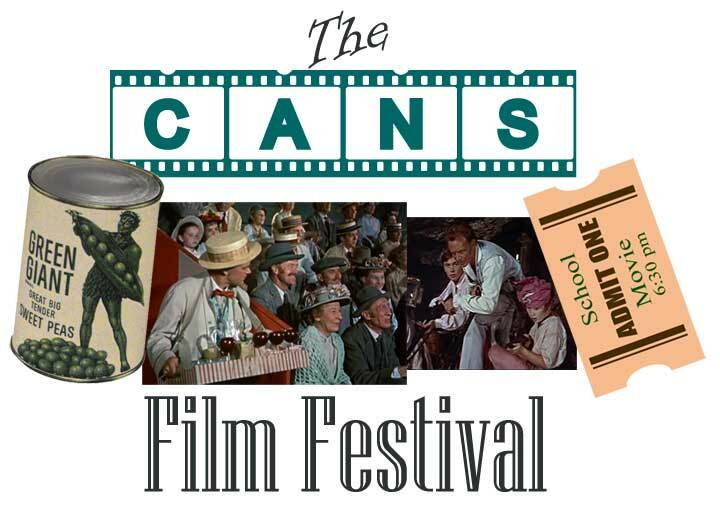 There, among an audience waiting in line with their cans of food, the excitement of the movie resided. The smell of popcorn was enticing even though I'd just finished supper. 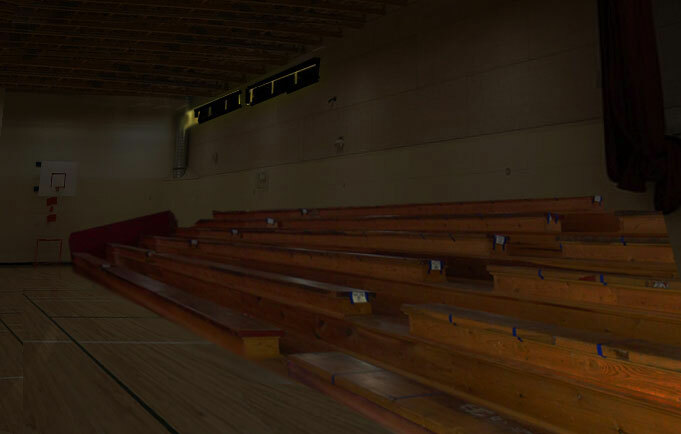 The school gym had been semi darkened for the movie, and the dim light was exciting. Looking out across the polished gym floor I saw a movie projector at the ready. In the bleachers sat many people waiting. I saw some parents with kids, but mostly just kids. Escalating the bleachers was always clumsy and noisy; more so when it was darker. The wood creaked and gave way to our weight as we snaked in between seated folks and kids waiting for the feature. I loved to sit in the middle section as that was where the best view was. Given that technology obviously wasn't what it is today, the quality of these events and presentations depended on the type of equipment used.Often, there were extreme limitations such as noisy projectors, flawed film, weak sound etc. The movies, however, played and sounded just fine, and I was captivated with each showing. After the third or fourth viewing I knew what was going to happen, but it didn't matter; I loved the movies more knowing what was coming. Adventure and the dazzling world of circus life was all too appealing. The notion of running away and joining up with high adventure under the big top was incredible. If an everyday kid like Toby, could go on to be a circus star, so could I! "Mr. Stubbs", the chimpanzee in the movie was one of my favorites and I was horrified when he got shot by a local hunter. In the darkened gymnasium, staring at the film projected on a screen, and all of this on a school night, made it the more exciting. The best part of all was that I could go back night after night, or for as long as I had a can of food to donate to the Sunshine barrel. The donation was another thing; I couldn't help but think about families and kids who could not come to see this movie simply because they didn't have the money. I thought about people who didn't have enough to eat. I then thought about myself, being able to watch a movie about a kid who becomes a circus star, while other real kids in real life, were hungry. The unexpected benefit was that I learned about donating to others who had much less than we did. The Sunshine Division was my first experience with understanding a world in need. All of a sudden it felt good to donate whether it was a few pennies, or a can of food. I even considered how much finer it was than actually paying an admission. And popcorn came with it! How could so much be afforded by so little? It was a situation that kept me pondering for years. Even though Mr. Stubbs got shot, everything in "Toby Tyler" ended well. There was enough kid-intrigue in the film to keep me on the edge of my bleacher. I never forgot this movie, or the long walks in the darkened streets and path of the school back lot. Those great experiences going to the school on a school night for some popcorn and a fantastic movie were wonderful. Previous Page Back to top Next Page: Jon Gnagy: TV's Greatest Artist!